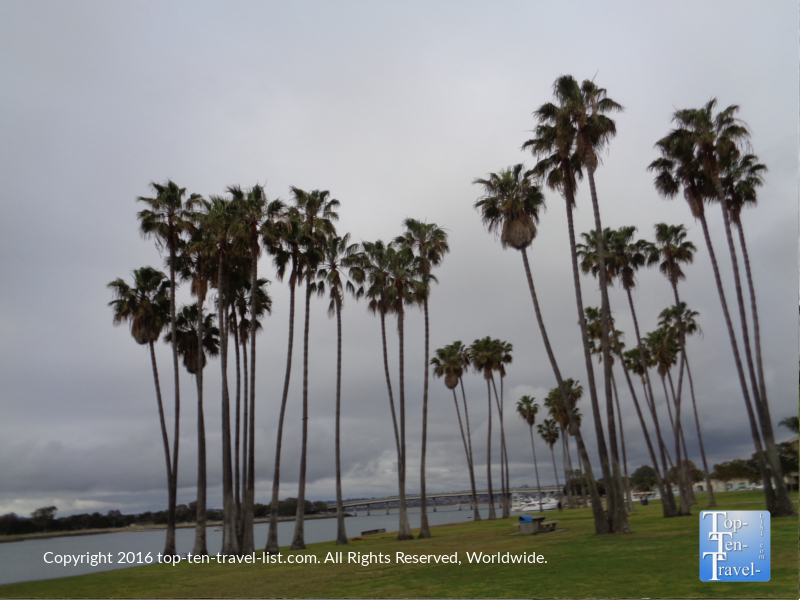 Attraction of the Week: San Diego's Mission Bay Bike Path - Top Ten Travel Blog | Our experiences traveling throughout the US. 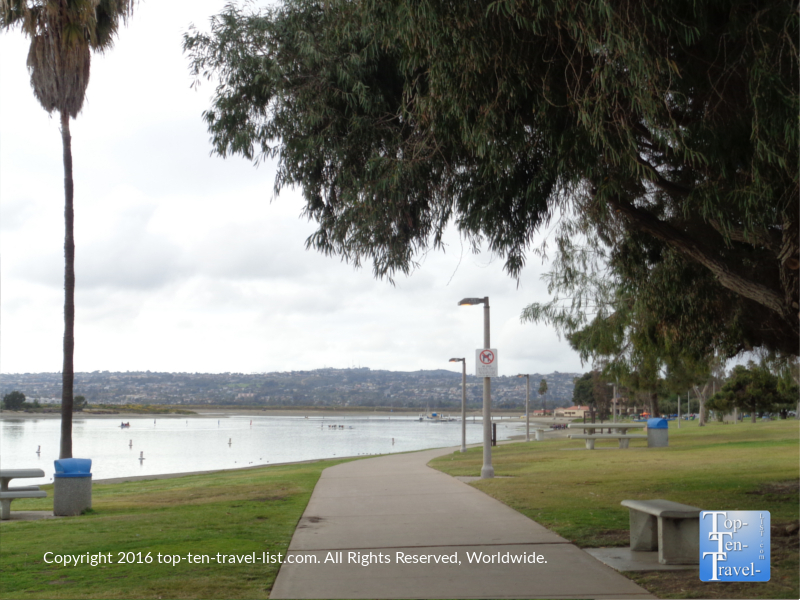 One of San Diego’s beautiful hidden gems, that any fitness/nature enthusiast must take advantage of, is the picturesque Mission Bay Bike path. 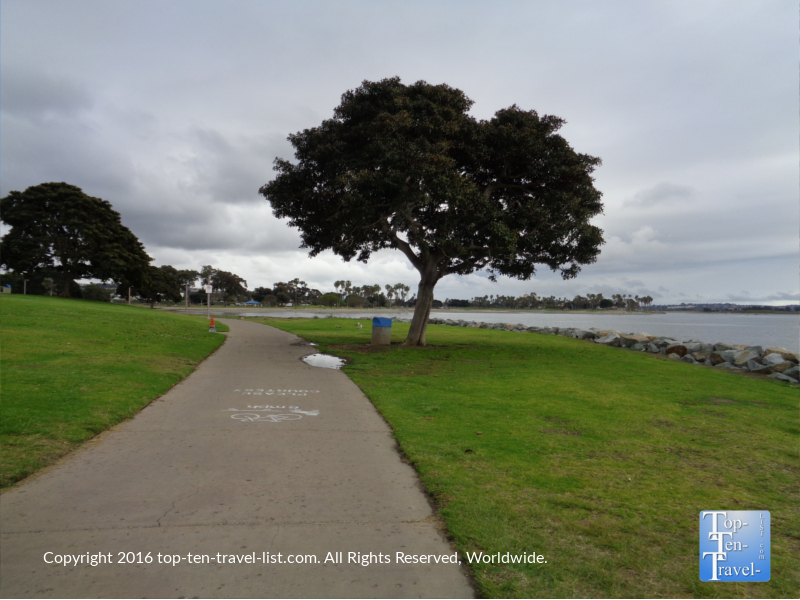 Offering a flat, paved, & gorgeous route away from the beach crowds, the Mission Bay path makes for a quiet escape for those who want to run/bike/walk with the absence of large groups of tourists, yet still enjoy a place with fabulous views. 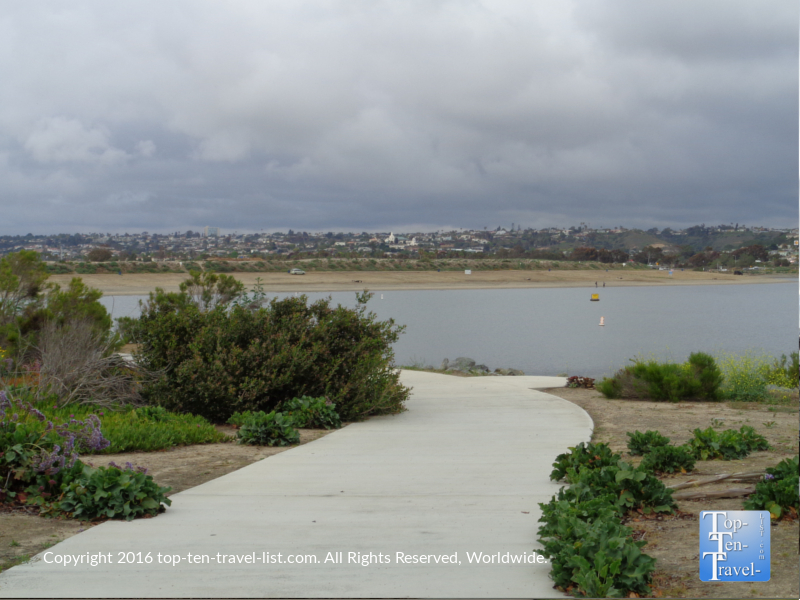 Starting at Mission Bay Park, you will enjoy a leisurely ride on a paved path with never ending views of the world’s largest aquatic park. 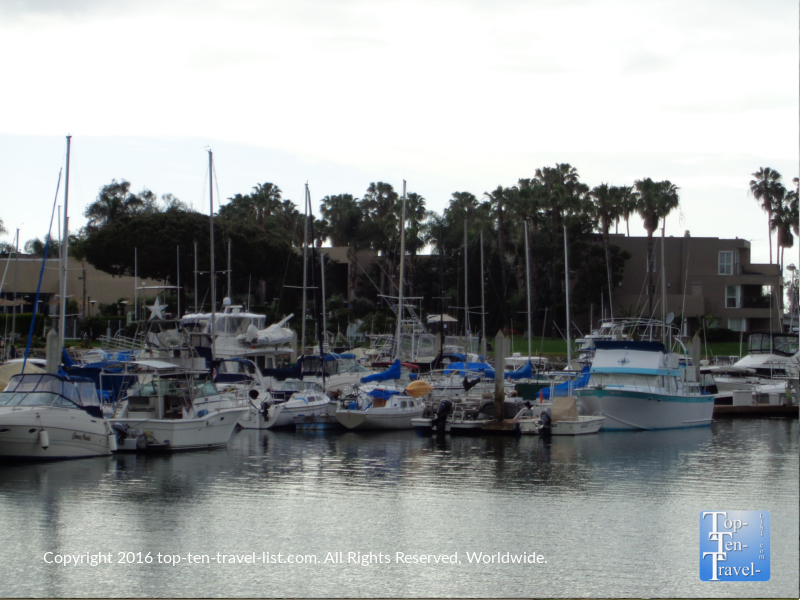 Palm trees, green grass, water, and pretty parks surround you in every direction. Being that there are no hills whatsoever, along with the general lack of crowds, the Mission Bay path is perfect for sightseeing and taking photos, as well as getting in a light, refreshing workout. 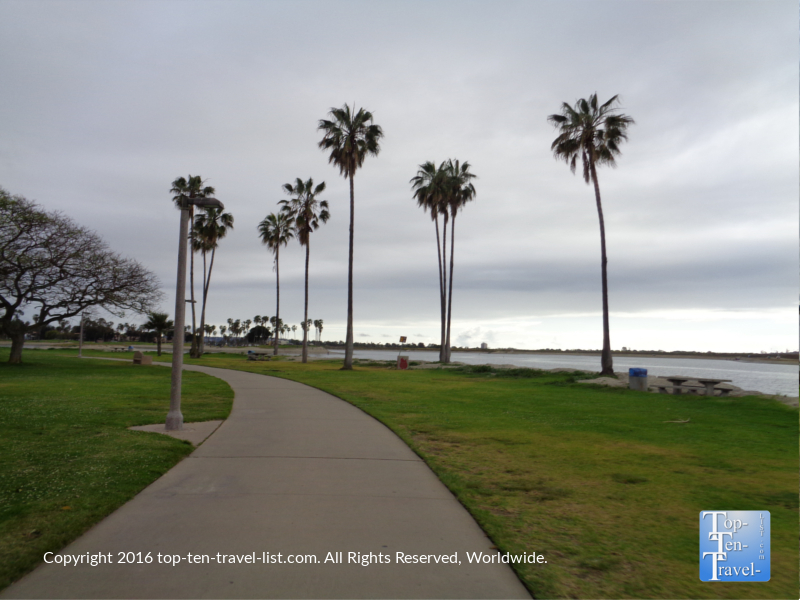 The full trail around Mission Bay is about 12 miles or so, however, you can turn around whenever you feel like it. 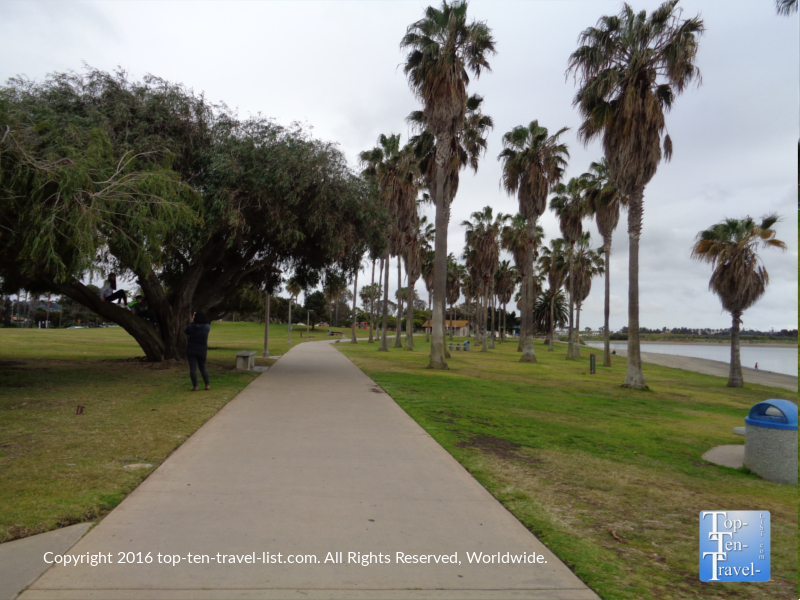 And if you are feeling extra pumped up, you can extend your ride even further, by connecting to other paths (Fiesta Island is very scenic and easy and the San Diego River Trail is another great option) and also take detours to Mission and Pacific Beach. 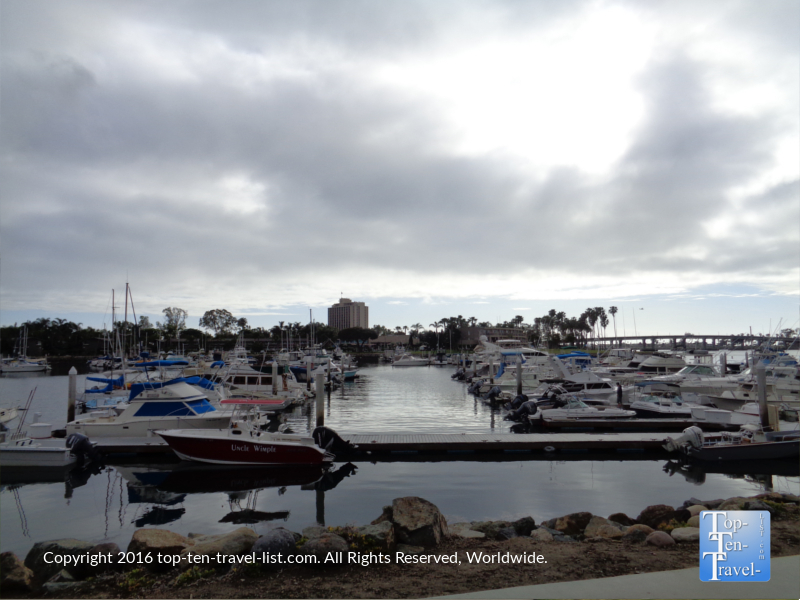 The options are endless really, and San Diego sure is a beautiful place to enjoy some long distance running or biking! 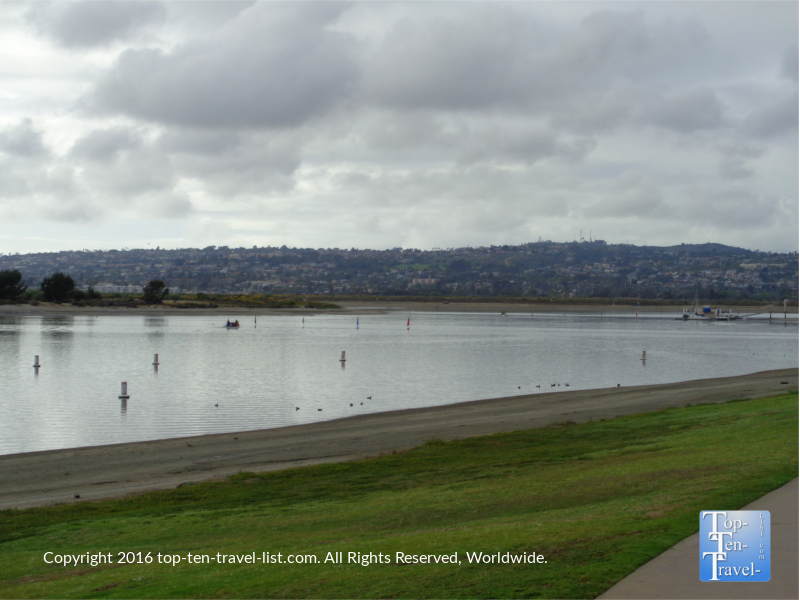 View of Fiesta Island, a nice side trip if you have the time and endurance! 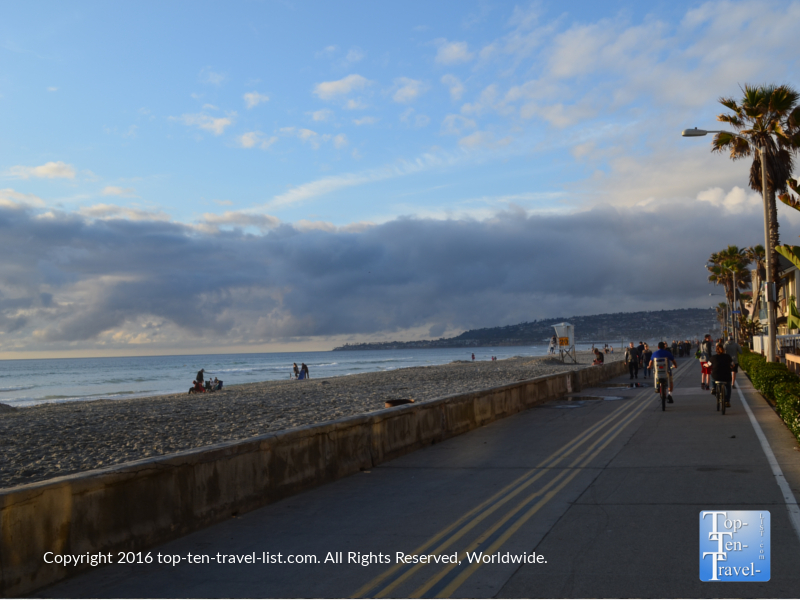 The beautiful Mission/Pacific Beach boardwalk path. 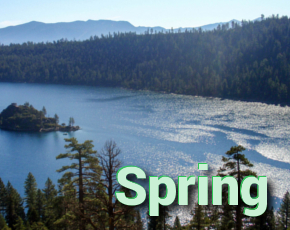 Biking is a great activity to incorporate into any vacation as it’s a fun & healthy way to explore the natural surroundings of an area and check out diverse neighborhoods in a short period of time. It’s also an entertaining & simple way to get in some exercise after all that time in the car/plane. More great views from the trail! This path is perfect for all levels due to the easy terrain. It’s not a rough and tough trail, just an easy stroll through nature, making it the perfect addition to any vacation itinerary. 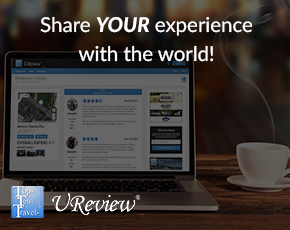 Plus, you’ll pass a lot of fun city attractions like Seaworld and Belmont Amusement Park (depending on how far you ride), so taking a break to explore famous attractions as these is just another option to extend your ride. Most of the beginning of this path is free of any vehicles, although there are a few road crossings the further you continue on. For a really easy, enjoyable ride with no road crossings, keep it simple and just bike around Mission Park (about 4 miles or so of easy riding). 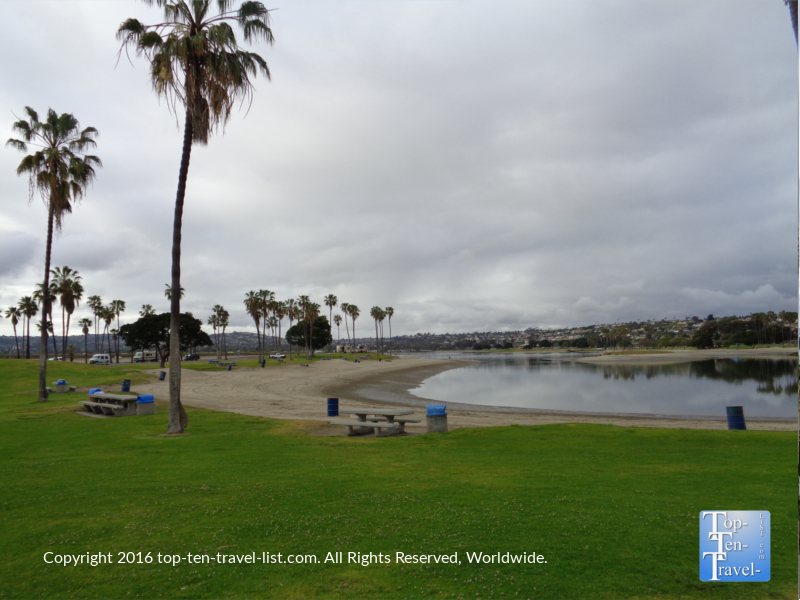 Mission Bay Park is located at: 2688 E Mission Bay Dr San Diego, CA 92109. Parking is free. 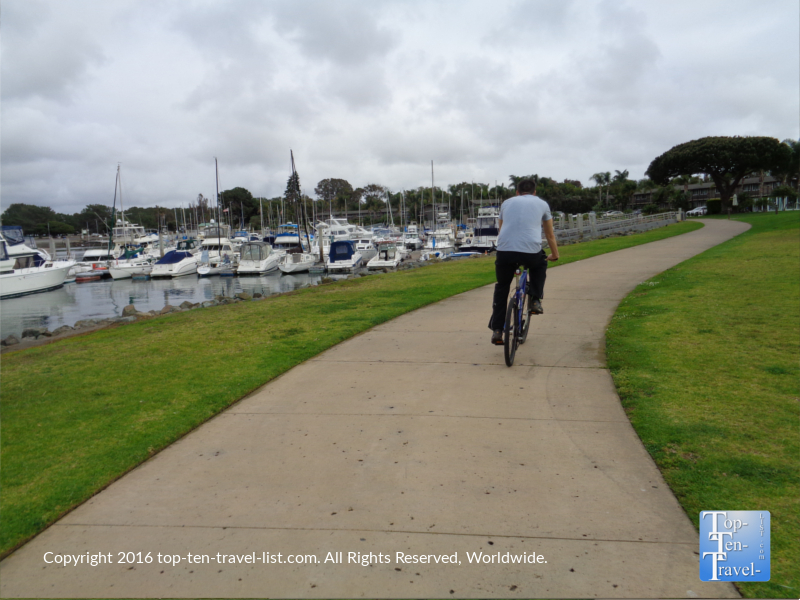 To plan your route, check out the full Mission Bay bike path map.